(1893-1969) A school teacher and Hamilton Centre member; received the Service Award in 1965. 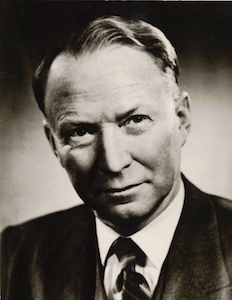 WILFRED S. MALLORY (1893-1969) was among those joining the Hamilton Centre when it revived in 1930. He was a teacher of Mathematics, Physics and Music at the city's Delta Collegiate where he organized the first school band. He was also a member or,he Scottish Rite and the Hamilton Camera Club. Wilfred Mallory served on the Centre Council for 25 continuous years, including a term as President in 1932-33. He spoke frequently at Centre meetings on a variety of topics from Meteorology/to Gravitation. When he received the Service Award in 1965, his guidance and encouragement of student members and young people was especially noted.